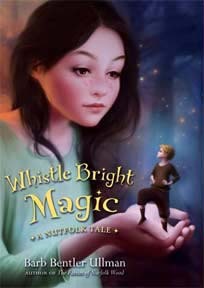 Describing the "Whistle Bright Magic, a Nutfolk Tale", a midgrade novel about divorce, the strength of family and friendship, and the magic of wood fairies who live in a stump, by author Barb Bentler Ullman. It has been twenty years since the time of The Fairies of Nutfolk Wood, and grown-up Willa has returned to Plunkit with her daughter, Zelly. Willa can't see the fairies anymore, but Zelly can, and she meets an unusual boy... the "mood catcher," Ronald Whistle Bright. The boy looks like a tiny Huck Finn with a strange glow, uncanny perception, and the ability to transport at will. Hard times have befallen the fairy town of Nutfolk Wood, but Whistle Bright is determined to stay in his forest village, even though humans are sure to destroy it. And Zelly wants to stay in the small town of Plunkit where she feels she belongs, even though her mother insists they return to their lives in the city. Zelly is convinced that she belongs in Plunkit, and only there will she find out more about her troubled father, who disappeared when she was three. In their quest to stay in the place that they love, the tiny Nutfolk boy and the human girl become allies... and that's where the magic begins.